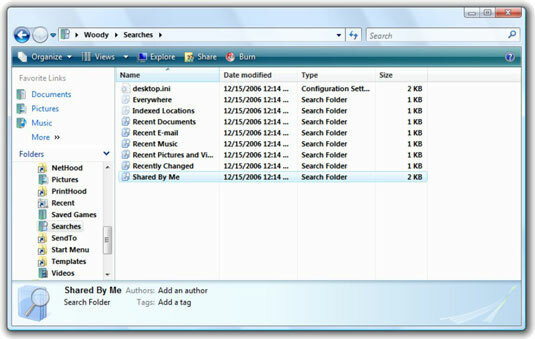 If you enabled your Windows Vista computer to share files and folders, you already know that you’re sharing the things in your Public folders. But if you’ve gone beyond that and established sharing privileges on additional folders, it’s easy to forget over time which folders have been shared. It’s important to periodically check your shared folders. Sharing privileges don’t go away until you manually remove them. So if you set up a privilege months ago for a one-time event and then forgot to remove that privilege when it was over, that person still has access to your files. It’s easy to lose track of what is shared, which can leave your files susceptible to damage, accidental or otherwise. On the left, under Folders, navigate to your Searches folder and click it. Vista saves a copy of your recent searches here. On the right, double-click the Shared By Me folder. Vista has a pre-built search saved away that lists all your saved folders. If you don’t like what you see, change the permissions now. If you see something you don’t like in here, right-click it and choose Share. In the Properties dialog box that appears, click the security tab. By clicking the groups and usernames in the upper list, you can see what permissions each is granted in the lower list. Click the Edit button if you want to change the permissions.